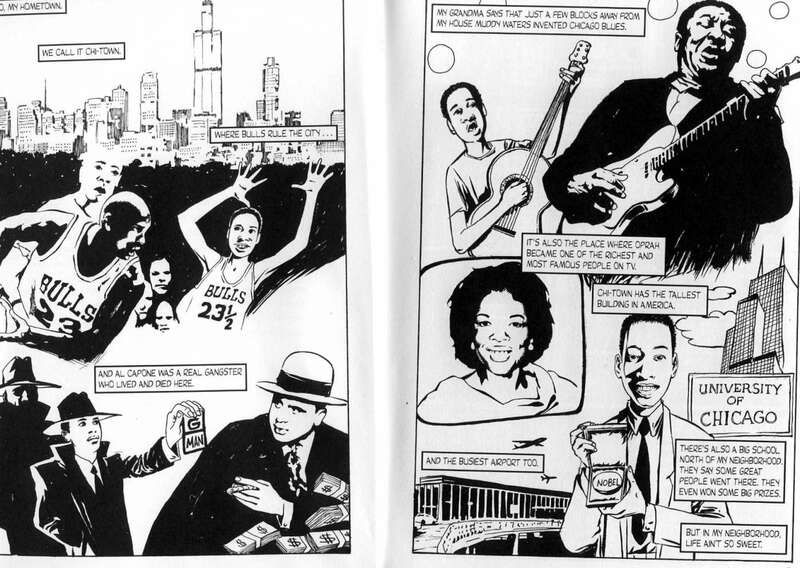 Technology has progressed so quickly in the last two decades that it feels old-school, almost disappointing, to encounter a black-and-white graphic novel. 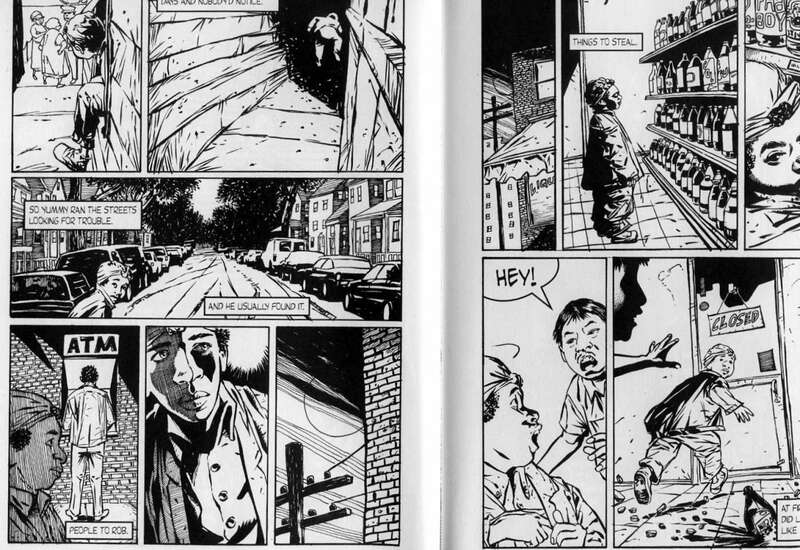 The brain has to work harder to fill in the blanks, to put the characters in context, to watch the story occur “in color.” Nevertheless, some black-and-white comics are worth the effort — and one of those is Yummy (Lee & Low Books), written by G. Neri, with art by Randy DuBurke. Look at this spread. The narrator, a boy who knows Yummy, is describing events. We follow Yummy from the time he crawls out his grandmother’s window to robbing a convenience store. But look at the bottom of the left page. 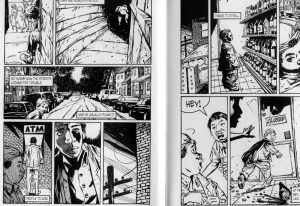 The three panels at the bottom display the magic of comics. The first shows a man at an ATM, with Yummy in the foreground watching him. The second shows a close-up of Yummy as he makes a decision. The third is a static shot of the night sky in a large city. What has happened in the gutter? Your imagination willingly fills it in. Magic. In 1994, the country was shocked by a shooting in Chicago. It appeared to be a gang-related incident perpetrated by an eleven year-old named Robert “Yummy” Sandifer. The girl who was killed was an innocent bystander who got in the way of a shooting meant to establish Sandifer’s credibility with his gang, most of whose members were much older. Neri creates a narrator named Roger, also a child, to help us process the true story. In a brilliant opening, Roger describes his hometown by putting himself in a montage of Chicago heroes. This not only endears us to Roger, but starts the depressing story off on a cheerful note to hook us. Roger decides to write a paper on the Yummy incident, so that he can put all the evidence together. He interviews community members, watches news reports, and reflects on his own interactions with the young gang member. Roger also tells the story of how Yummy’s gang took care of the problem, which resulted in Yummy’s mysterious shooting before the police could find the young suspect and incarcerate him. Roger, and readers, come away with much more empathy toward Yummy than the generalized stereotyping caused by the hysteria in the 1990s. In my book Comics, Graphic Novels, and Manga: The Ultimate Teen Guide, Yummy is on my list of graphic novels that every middle school should have.